Much to the delight of the govt employees, Cabinet today approved for release of 6% Dearness Allowance (DA) to all India Service Officers/State Govt Regular Employees/Pensioners/Family Pensioners w.e.f. 1st January’ 2016 at par with Central Govt Employees. 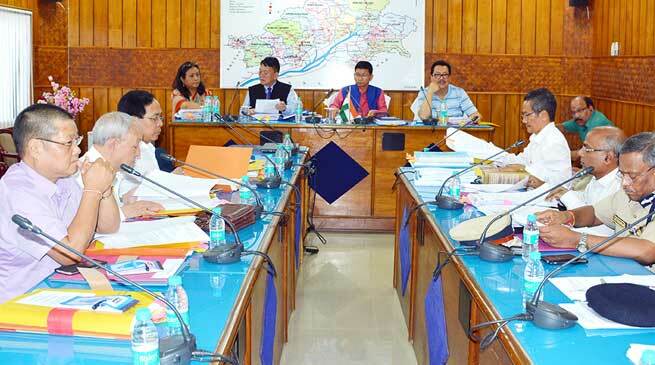 The cabinet meeting was held under the chairmanship of the Chief Minister Kalikho Pul. creation of 411 posts for establishment of the state’s first Medical College under construction, of which 200 posts for faculty members and another 211 for supporting staffs. The Cabinet approved for post creation of 106 posts of different Cadres for Arunachal Civil Secretariat under GA Department. The Cabinet also approved for opening of 21 Women Police Stations along with creation of 401 Posts under various categories. The proposal for resolving the long pending issue related to promotion of Constables to Head Constables under the Police Department was also approved. The Cabinet also approved for creation of Police Station at Palin under Kra Daadi District. In order to meet the shortage of Police Officers in the state, the cabinet decided to promote 5 senior most Additional Superintendent of Police (Grade-I) to the rank of Superintendent of Police (Junior Admin Grade). Cabinet also discussed the agenda points proposed for the 11th meeting of Inter-State Council being scheduled on 16th July’ 2016 at New Delhi under the chairmanship of Prime Minister of India. The Inter-State Council embodies the spirit of cooperative federalism and serves as platform for both the centre and the state to discuss issues of common interest and to make recommendation for better coordination of policy and action. The Cabinet also decided to make Arunachal State Medical College, Naharlagun into a Scientific Society called “Tomo Riba Institute of Health & Medical Sciences, Arunachal Pradesh” under the relevant Societies Registration Act 1860 (Central Act). This Scientific Society will look after the establishment of Medical College and other Institutes for medical education, training and research. It will also look after the issues relating to establishments of hospitals to provide advanced and specialized medical facilities including teaching under Graduates and Post Graduates medical education and paramedical courses.